As a professional hair stylist, you know that a good bio helps you get more clients. Here are some tips for how to write a short hair stylist bio, including a useful fill-in-the-blank bio template with example wording. The truth is, people do not read bios… they skim them. So keep your bio short and to the point. That way, there’s more of a chance that the reader will remember the most important points. You have special talents and abilities, even if you’ve never considered yourself that way. Even if you’re just starting out, you can highlight your ability to listen to a client’s needs or how up-to-date you are on new styles and techniques. If you have certifications in hair color, facials, make-up, or any other beauty routine, be sure to list them. Where were you trained and when? What awards or professional recognition have you received? What are your specialties? Check out the bios of a few other stylists, preferably those in your own area, maybe even those whose work or salon you know. What are they doing? When you read their bios, what grabs you and what leaves you cold? Although you don’t want to copy other people’s writing, you can get inspiration and then tailor it to your bio. 5. What products do you use? In some salons, you may not have any control over that, but in many cases, stylists have favorite products that they use consistently. If you’re one of those, be sure to say so. Customers are often loyal to particular brands, so if a Paul Mitchell fan reads your bio and sees that you only use his products, she’s likely to pick up the phone and schedule an appointment. 6. Are you enthusiastic about special events ? 7. Why do you love doing this? A stylist’s personality is nearly as important as technical skills. If you simply love making people look their best, then say so. Share why you chose this career instead of X-ray technician! Let potential clients know that when they’re in your hands, they’re in the hands of someone who genuinely cares about making the world more beautiful. Hi, my name is _____________ and welcome to my shop/salon ______________. Ever since I gave my first Barbie a buzz cut (don’t worry, I’ve improved since then! ), I’ve loved to cut hair. In ___________ I graduated from the ________________ School of Beauty and Hairstyling. In addition to passing all of my final tests with high scores, I also received certification in coloring, facials, and waxing. I specialize in working with long hair, creating updos and styles that can be worn every day. I am available for haircuts and shampoo/styles during regular shop hours, ______________ Monday thorough ___________. In addition, perms and hair coloring appointments are usually available a minimum of 48 hours in advance, and with 72 hours’ notice, my assistants and I can handle bridal and special events groups of up to eight individuals. Our salon proudly uses _________products, which are eco-friendly, not tested on animals, and hypoallergenic. Our fine lines of shampoos, conditioners, mousses, and de-tanglers are also available for purchase__________ . Nail Boutique is located at the rear of our salon, and our customers get a 10 percent discount on all manicures. Just as every stylist and salon are different, so will every stylist’s bio. The important points to remember are using this information to establish trust, confidence, and desire in potential customers. Once they’ve read your bio and seen your work, you want them to come to you instead of clicking on the next site. Creating a lively, informational, and friendly bio is a great way to get them in your door. Need more help? 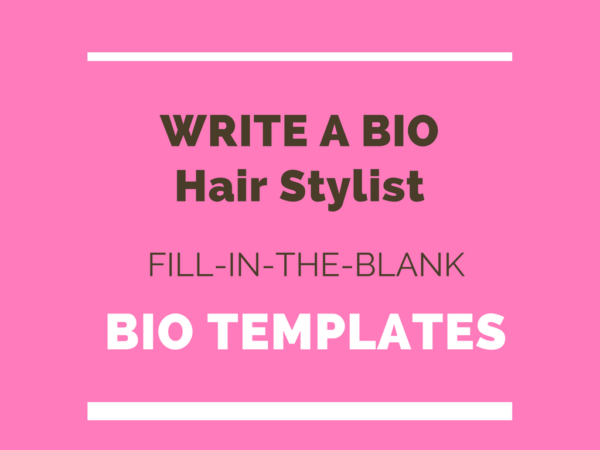 If you don’t feel confident about your writing, or you’re simply in a hurry… go to How to Write a Bio to get detailed fill-in-the-blank Hair Stylist bio template.